118 Comments	This post may contain affiliate links. 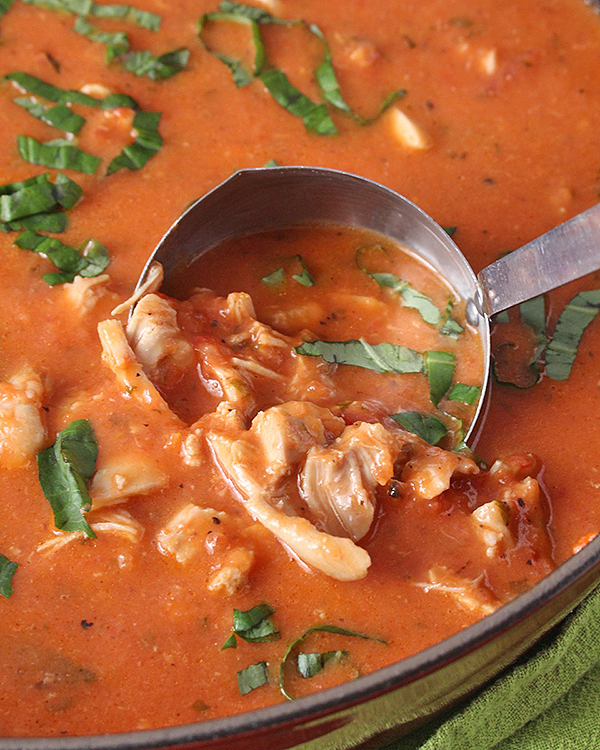 This Paleo Creamy Chicken Tomato Soup is the perfect easy dinner. 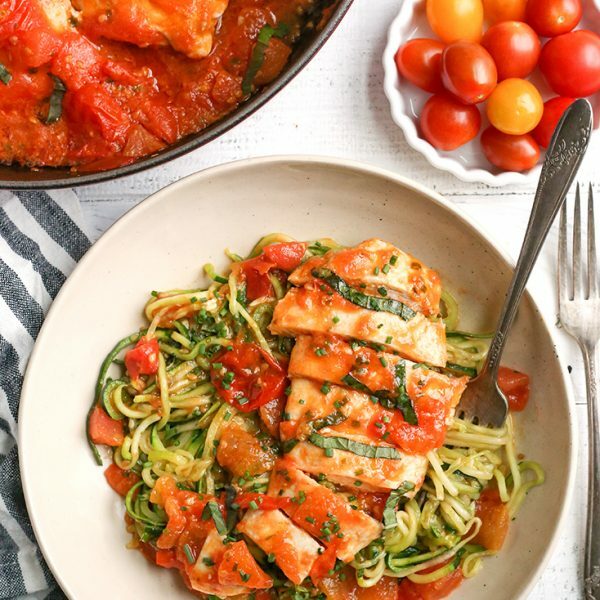 Ready in 30 minutes, so delicious, and healthy. Whole30, gluten free, dairy free, and low FODMAP. I’m back with another low FODMAP recipe that is easy and delicious! One of the huge adjustments of this diet is no garlic or garlic powder! I was used to adding that to everything and without it some recipes taste kind of flat. Well, I discovered garlic infused oil is allowed and it’s been a life saver! I’ve been using it for so many recipes to add that distinct flavor and it’s working. I found some at a health food store and then I ordered more from Amazon. 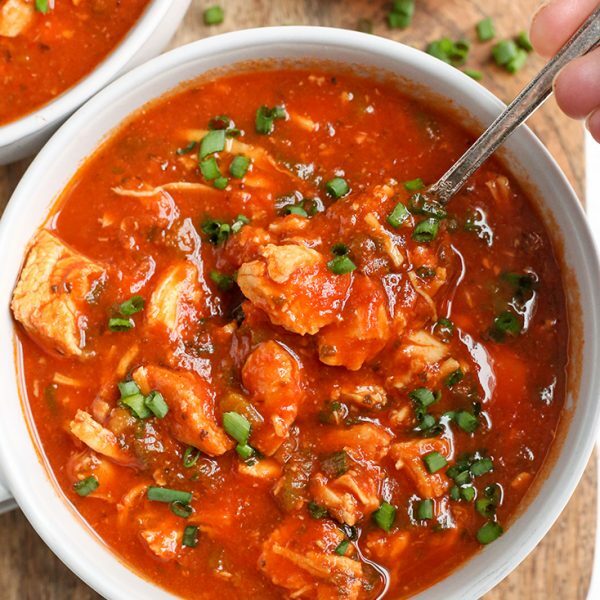 Now about this soup- it is so easy to make and comes together quickly. It’s made in one pan which is always nice for cleanup. I used a cast iron brasier (this one), but a stock pot or dutch oven will work great as well. 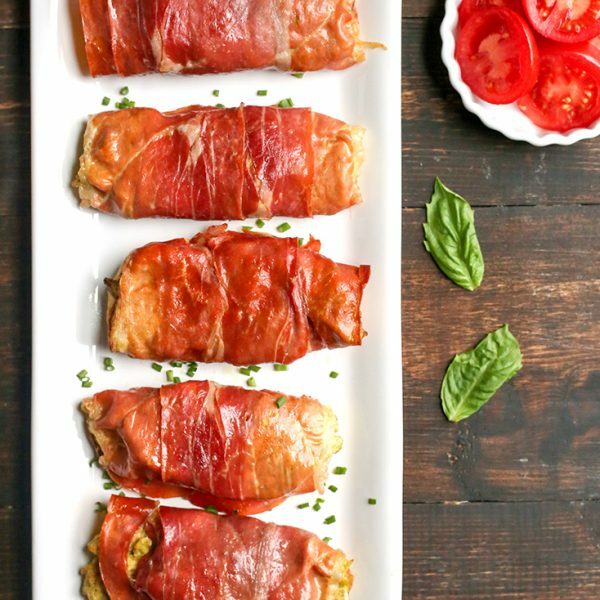 Using fire roasted canned tomatoes for this is the best because they have more flavor and don’t taste as “canned”. This soup is naturally gluten free, using coconut milk makes it dairy free and it also happens to be Whole30. But it is comforting, warm, and no one will guess it’s “health” food. 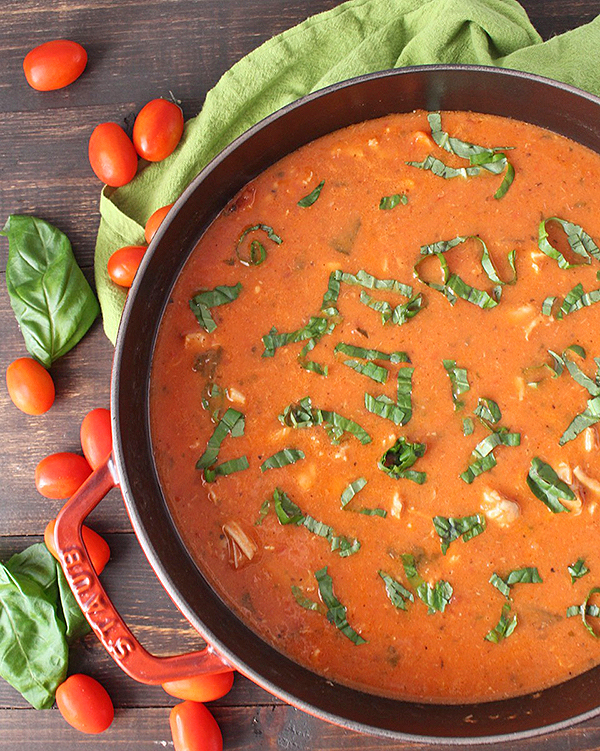 The combination of garlic, tomato, and basil is so perfect and satisfying. I know we are coming out of soup weather, but I think this is good enough to make even in the summer. 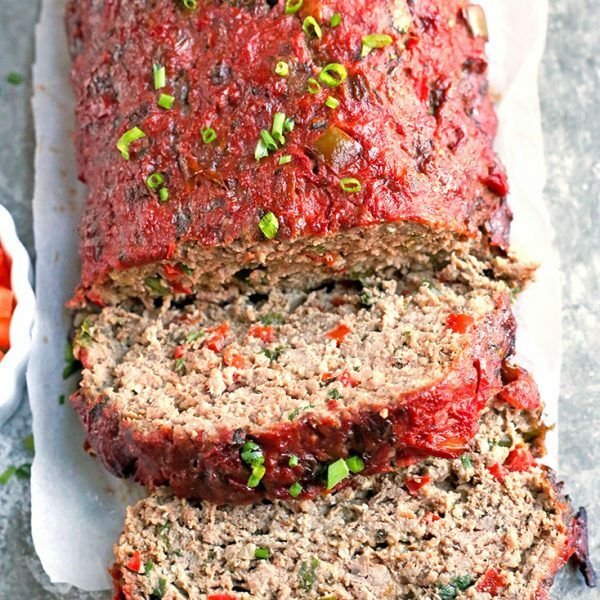 Maybe with fresh tomatoes? That would be delicious! You will love this easy soup that is creamy, hearty, and so flavorful! 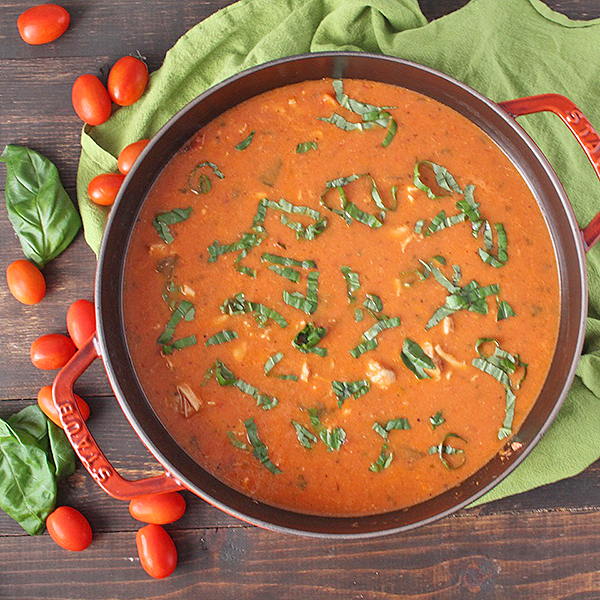 In a large stock pot or cast iron brasier, combine the tomatoes, broth or water, pepper, salt, basil, and garlic oil. Str together and place the chicken in the mixture, covering the pieces as much as possible. Cook on medium heat, covered, for 25 minutes, stirring occasionally. 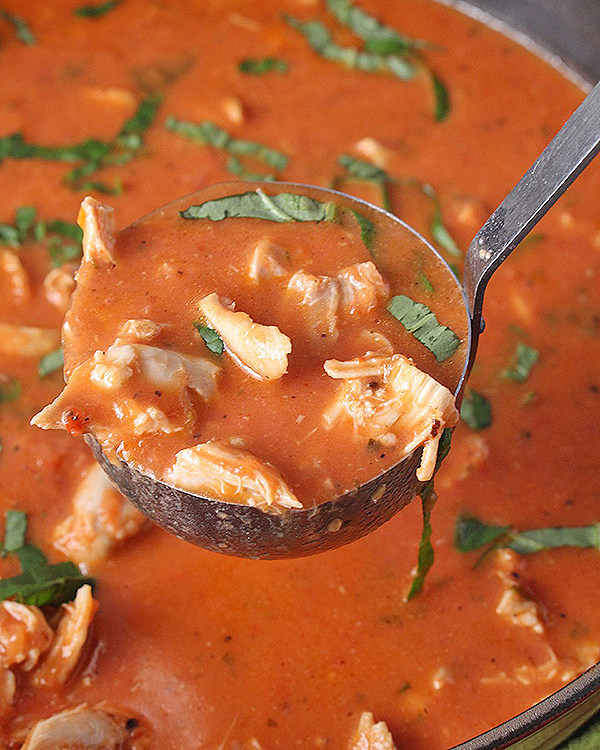 Remove from heat, take out chicken and set on a plate, and blend soup with an immersion blender. Add in coconut milk and stir to combine. Cut up cooked chicken and add back in. Cook on medium for 5 more minutes and serve. Top with addition basil and garlic oil if desired. 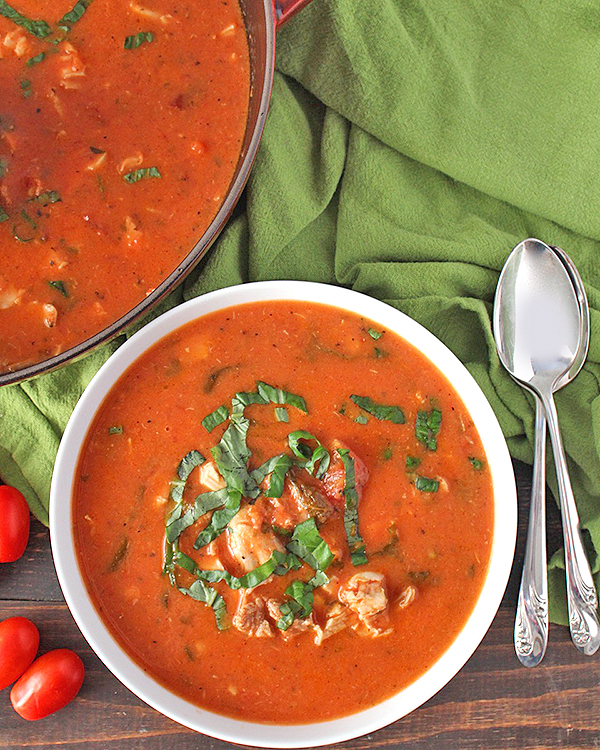 Place tomatoes, water, pepper, salt, basil, garlic oil, and chicken in the Instant Pot. Stir well and place the top on. Secure it and make the the valve is closed. Hit the "manual" button and reduce time to 7 minutes. Once done cooking hit "cancel" and release the valve. Remove the chicken to a plate and chop. Blend the soup with an immersions blender. Add in the coconut milk and chicken and cook (sauté) for 5 minutes. Very good! I omitted the garlic oil as I can’t gave garlic but still very delicious. My husband isn’t a soup guy but ended up eating two bowls the night I made it. Thanks for the instant pot version, it was great! You’re welcome, Bonnie! Thanks for trying it and I’m so glad you like it! This is my absolute favourite soup! Thank you, Lisa! I’m so glad you like it!